A little over two years ago, I wrote a short piece in a military engineering magazine about the potential importance of the microbiome in the Department of Defense (DoD). Two months later, the head of the VA Rocky Mountain Mental Health Research Center, Dr. Lisa Brenner, contacted me and said she would like to start a microbiome project for DoD, Veterans, and their families. Our initial talk morphed into starting a new consortium with Dr. Brenner, Dr. Christopher Lowry (University of Colorado Boulder), and Dr. Teodor Postolache (University of Maryland). 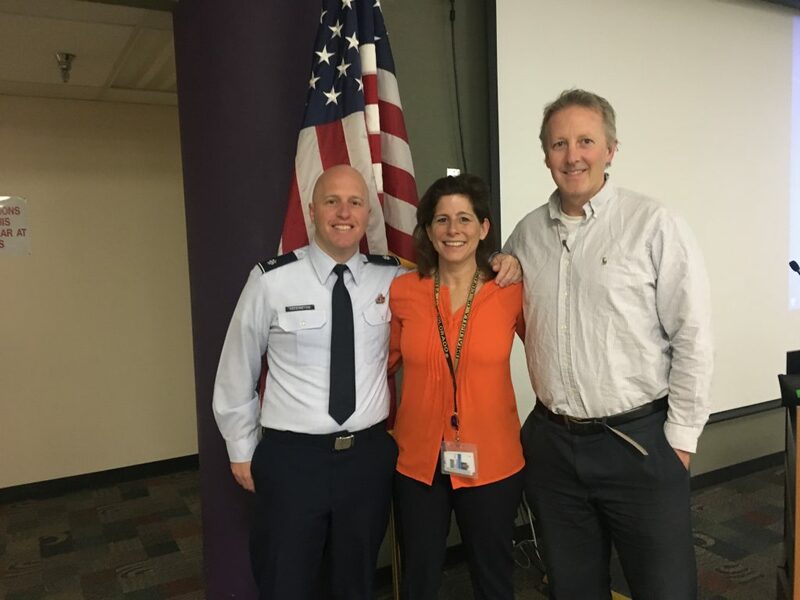 Since that time, we have been working on a number of grants and I am leading a major grant from the Alfred P. Sloan foundation to study the microbiome of the built environment at the United States Air Force Academy (USAFA) with two other experienced researchers, Dr. Jack Gilbert (University of Chicago) and Dr. Kerry Kinney (University of Texas). For those of you that know me, you might be thinking why is Andy writing a blog about being a junior researcher since he is nearly 40, has four kids, and (I believe)related to both points has already lost most of his hair. True enough, through my 16 year military career I have been fortunate to lead a number of people, responsible for hundreds of millions of dollars worth of construction projects, and now manage Environmental Engineering at USAFA. However, at the start of the talks with these established scientists, I was only two years removed from my PhD, had no postdoc experience, and had four papers published in peer-reviewed journals. The following are my perspectives and thoughts on being a (relatively) junior researcher working with established peers. Just do it. Collaborations, like those resulting from the expansion of microbiome of the built environment field, are becoming more common as the field delves into challenging problems that involve different specialties. But still it leaves the question, how do you get invested with established researchers? The tradition of the academic processes of peer-reviewed publications, establishing connections through your advisor or other professors, and social media are great ways of starting collaborative research with established peers. However, you may need to be more proactive. I have found that approaching professors at conferences is a great method to start a connection for future collaboration. Before a conference I look to see who is attending and/or presenting and investigate a few professors in detail using peer-reviewed journal search databases, ResearchGate, and even Twitter. After reading several of their papers I gather my thoughts about how my expertise and opportunities intersect with their established programs. At the conference, I then approach the established researcher and if it goes well, end the conversation with a discussion on collaborating on future grants or papers. Believe in yourself. Assuming you get the chance to collaborate with established researchers, you have to say yes! And that is certainly not an easy step. In my collaboration I am working with folks that have hundreds of publications, scores of PhD’s working for them, and are established as leaders in their field. To be blunt, it was very daunting in the first few meetings. There were times I doubted my worth to the group but these last two years have taught me an incredible amount. My approach has always been to get as much information as I can before a meeting to be prepared. It is important to remember senior researchers have tremendous experience. If you have gotten to this step you should know the senior researcher wants to work with you and sees potential in what you can provide to the research project. So be confident! Let your boundaries be known. As you get involved in research with established professionals, you may find that it is hard to say no to new ideas or new projects. I think it is important to clearly articulate how much time and freedom you have to work with this new collaborator. Being honest and up front with limitations, which everyone has, will benefit both you and the senior researcher. Time is certainly a critical factor to consider but it might not be your only limitation. For me, a larger limitation then time was that I only supervise undergraduates at USAFA and what that means for our facilities, lab equipment, and my labor pool. To ensure the established professional understood, I went as far as hosting them for a half day so they could better understand the limitations. My biggest limitation actually turned into a positive position as these senior researchers connected me with their post-docs, PhD students, etc. to help get our work done. Be ok with what you don’t know. When you are working with established peers in the field, you may think that you are behind because they have more knowledge, even if you are in the same field. It was important for me to realize and accept that as a junior researcher I don’t have either the experience or resources of established researchers. I have not had postdocs and PhD students that have worked for me for years. If I want to find out an answer, it is up to me to do the research. Also important for this thought, if you are working on collaborations with other fields, you don’t need to spend too much time learning their field. You will never have their expertise, which is the primary reason for working with them. I work with psychologists, psychiatrists, and neuroscientists. I have learned so much from working with them about fields I had little to no knowledge of two years ago. Often I will find myself reading journal articles that I might not have in the past. Overall though, I have found if I have an idea of the terminology and processes my peers are discussing I am able to understand how to insert my expertise. Microbiome research is an exciting field that is also very complex. Considerable breakthroughs can happen with collaborations across disciplines. I feel this field is therefore an excellent opportunity for junior researchers to partner with more established peers, especially in the field of the microbiome of the built environment. This field in specific has been energized through the generous grants and conferences sponsored by the Alfred P. Sloan Foundation. So for those junior researchers reading this, I encourage you to get out and find some new connections. Be unafraid and confident in your abilities. I can attest to the rewards that these collaborations can have, and at least for me these collaborations have been more rewarding than what I could have even imagined.